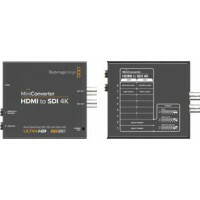 Mini Converter HDMI to SDI 4K Convert SD, HD and Ultra HD HDMI with HDMI/analog or AES audio to SDI. 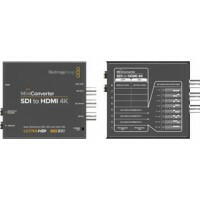 ..
Mini Converter SDI to HDMI 4K Convert SDI in SD, HD and Ultra HD to HDMI 4K with analog and AES audio. 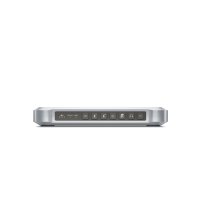 ..
UltraStudio HD Mini UltraStudio HD Mini includes 3G-SDI, analog YUV and composite NTSC/PAL video inputs, two channel analog audio in, and reference as well as RS-422 for deck control! For output, you get dual link 3G-SDI with simultaneous fill and key, plus HDMI. 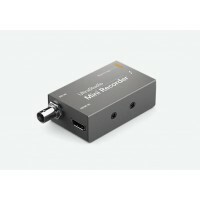 UltraStudio Mini also features Thunderbolt 3 so you get incredible 40 Gb/s performance for capture and playback of fully uncompressed video, leaving your computer’s CPU free for more processing tasks. ..